The new version 2.7 of Comarch Campaign Management has been released. 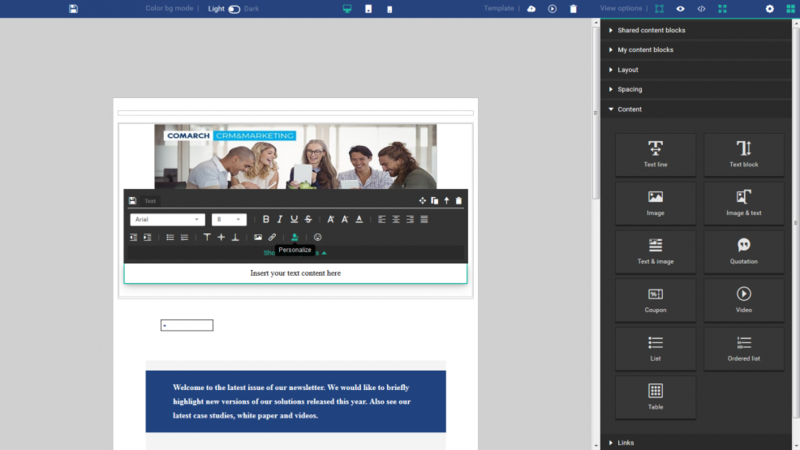 It introduces new communication channels: mobile push & in-box messages, new simplified & intuitive Email Creator with drag&drop capabilities. It also brings key changes related to Task Overview. New types of report templates related to: Tasks, Mobile Push & In-box channel and Twitter have also been added. 2 separate task views: calendar view and task list view - it contains new filters, chart and calendar/task list (grid), where the user can see the tasks displayed according to selected filters. Access to task overview and displayed tasks determined by user profile privileges - the user can see tasks assigned to employees linked with his/her department. Dynamic Conditional Blocks - The user can add dynamic blocks into the email message template and define different versions with specific content. A selected version is displayed if defined conditions are satisfied by a customer. New Rules in Contact Strategies related to Mobile Push & Inbox Message Channel - In global contact strategies and contact strategy for segments new rules linked with mobile push and the inbox message channel have been implemented. New rules enable the user to set up the frequency and time of communication via mobile push and inbox message.